Abby the Librarian: Preschool Storytime: Leap Day! 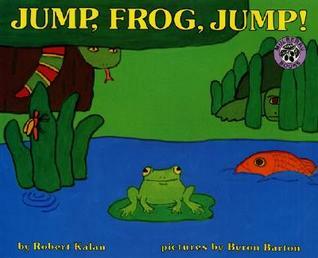 Book: Jump, Frog, Jump! by Robert Kalan, illustrated by Byron Barton (Greenwillow Books, 1986). 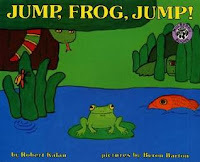 This cumulative story has the repeated refrain "Jump, frog, jump! ", which I asked all the kids to say along with me. There's a definite opportunity for STEM connections here - you could talk about pond life or the food web. Song with Prop: Five Green and Speckled Frogs. I am pretty sure that this prop idea came from Susan Dailey. The frogs are on thin strings and as each frog "jumps into the pool", I pull its string and it hides behind the board. Book: If You're Hoppy by April Pulley Sayre, illustrated by Jackie Urbanovic (Greenwillow Books, 2011). Since I had a little bit of a squirrelly group, I had everyone stand up and we did actions to this book. We hopped like bunnies and frogs (and crickets), growled like dogs and bears, etc. This is a fun action book, but you could also use it to practice some brainstorming - think of more animals that hop or growl, etc. I had a kind of young crowd, so I just did the actions with the book. 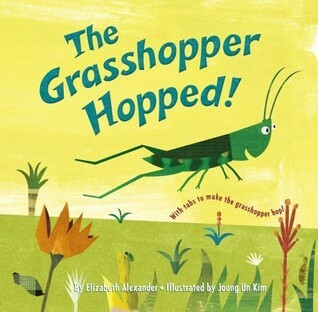 Book: The Grasshopper Hopped by Elizabeth Alexander, illustrated by Joung Kim (Golden Books, 2010). This book has some fun rhymes and a really strong rhythm. Tabs move the grasshopper as he hops from place to place, keeping the kids' interest. I like to read this one very rhythmically. Whenever I pass out the scarves, we start with a few little "warm ups" and wave our scarves high and low, fast and slow, and toss them in the air. When we finished our song, I asked the kids to bring them up to me by color. Song: Jumping and Counting by Jim Gill, from the album Irrational Anthem. I don't use a ton of recorded music in my storytimes, but I love, love, love Jim Gill and this one fit in perfectly with our theme and it was super fun. Kids dancing along to this song are practicing listening and following directions as well as tons of counting. 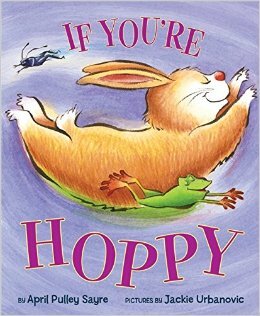 Any books, songs, or activities having to do with animals that jump, hop, or leap: frogs, rabbits, kangaroos, crickets, fleas, etc. etc.! Did anyone else do a storytime or program for Leap Day? Please share what you did!